Andrea’s breakfast post inspired me to write down some thoughts about eating a healthy breakfast. Just a few months ago, I’d grab a pre-made protein drink from Odwalla or Boultons and run out the door with it, in a style I called eat-while-running away. On arrival at work, I’d stop at Tullys and grab a coffee with soy milk. By lunch time, the lack of a healthy breakfast made me desperate for real food, and I’d eat more of the wrong stuff. The cycle kept repeating itself. When I started reading labels more closely for sodium content, though, those convenience drinks stopped making it into the shopping basket, and coffee was replaced by tea, which was much more tasty. I started thinking about food in a more wholistic way, more as a series of choices that would blend together to keep my energy balanced throughout the whole day. My considerations for breakfast are (1) high protein (2) low salt and (3) tasty and nutritious. I just noticed that I like to garnish with strawberries or grapes when I looked at the images. Here are my 10 favorite ways to a healthy breakfast. One of the best dishes of oatmeal I had in recent years was at a restaurant. It was a shallow bowl of oatmeal with mango puree and raspberries in the center on top. This started my love affair with fruit in my oatmeal, and not just the usual raisons. I tried fresh fruit in season, little cups of fruit in juice (peaches, pears, oranges), diced prunes and dates, mango slices and bananas. Sometimes, I tried more than one at a time! I stopped adding milk, yoghurt, cream or any dairy to the breakfast. I also stopped adding sweetener most of the time, as the fruit was sweet enough. On the odd occasion, I’d add a little maple sugar, date sugar or honey, depending on what fruit choice I made. If the fruit was not juicy enough on its own, a little mango nectar is a perfect addition. Almost any flatbread will do for this recipe, depending on what you have on hand. I like fresh corn or flour tortillas, potato flour flatbread, pancakes or crepes, or even the various thin-bread you can get now in most stores. The roll-up is just the medium to keep the ingredients off your fingers. I like using fillings like peanut butter and honey, banana, strawberries and nutella, potato salad, stir fried veges and tofu, vege bolognese, eggs and cheese, leftovers of various kinds – mashed potatoes with chicken breast and tomato for example. I’m a big fan of yoghurt with live cultures, especially probiotics. It helps balance your stomach, which is perfect after a night where you stayed up too late, or ate weird food the day before. I like to add fresh sliced fruit, berries and a little local honey for the burst of flavor and for color. Colorful foods wake up my senses in the morning. Usually, this is paired with a protein drink made from fresh juice and WPI (whey protein isolate) for the energy. I know, that sounds like an odd name for a breakfast food – rock cakes. However, it is the Australian name for scones with dried fruit in them. If you are making scones and the dough gets overworked, the scones will not be as light as what Americans call biscuits, and which we Aussies call scones. So stick some golden raisons, chopped dates or fruit peel in them, and serve with butter and jam. A drizzle of honey adds joy. Simple and delicious. I make these every morning, and take one to my sweetie to help him wake up. I found that protein wakes my brain up faster than tea or coffee, though tea in the morning is a must for the day. I like orange, guava, mango and pineapple juice, and use some or all as a start and about 18 oz. We like Whey Protein Isolate, or WPI, as it dissolves completely. We get it from Super Supplements, though my sister tells me she also found it in a health food store in Sydney. Mix it up with a blender, or shake it in one of those handy mix bottles with the round ball in it. Serves two. Optional additives are vegetable juices, a blended banana, flax seed oil or wheat germ. The juice gives an energy boost, and the protein sustains you through the morning. One thing to keep in mind is to use whole juices, rather than extracts, and if you fresh squeeze your fruit, it’s like a taste of paradise. All the texture, flavor and delight to the senses. Fresh fruit, in season, is a fabulous way to begin the day. Don’t forget to include baby tomatoes (also a fruit) in the mix, with edible flowers if you like them. One of my favorite ways to enjoy fruit salad is to prepare a batch for a few days, slice up cheese ahead of time and serve the cheese on the side. These small quiches are just the same as large ones, only cuter and made in a tiny muffin pan. Colleen’s pastry recipe is a good choice for the crust, nice and thin. Add mushrooms, scallions, veges or salmon and bacon if that’s how you roll. Mix the eggs up with heavy cream for a rich taste, and cap it with grated cheese. Quick and easy once you have the pastry made, and you can make pastry in batches to freeze. Cook in a 375 degree oven for 12-15 minutes. While a few of these are great for breakfast, keeping some on hand is helpful for casual guests or afternoon tea as well. Categories: breakfast, Quick meals | Tags: breakfast, burrito, fresh food, fried rice, healthy breakfast, muffins, oatmeal, protein bars and drinks, rock cakes, top 10 breakfast | Permalink. I am a creature of habit. I find something that works, does not make me sick to my stomach, makes me feel full, and I am happy to eat it every day. For some odd reason, my new habit became a poached egg over baby greens for breakfast. You don’t need oil to make a dressing, the creaminess of the poached egg creates a rich dressing to the salad. What is also nice about this is the speed of which you make it. It takes only a few minutes to cook the egg and you don’t have to waste time with having oil emulsify in a dressing. The protein keeps you full, and of course I have to add Sriracha, which to my surprise only has 100mg sodium per serving. SCORE! Heat water until boiling with about 1/4 cup of white vinegar in a small pan or deep edged pot, (enough to submerge the egg). Reduce head to a rolling simmer and cook the egg in the water for 3-4 minutes. NOTE: this makes a soft boiled egg. I personally do a double transfer to make sure the egg is drained well. You can remove it with a slotted spoon, place it on a small dish to further drain, and then transfer it to your salad. I bet there is a professional way to do this that does not add extra dishes, but this has worked best for me. Sprinkle the greens with the champagne vinegar, add the egg, freshly cracked pepper, and enough Sriracha to make you happy. 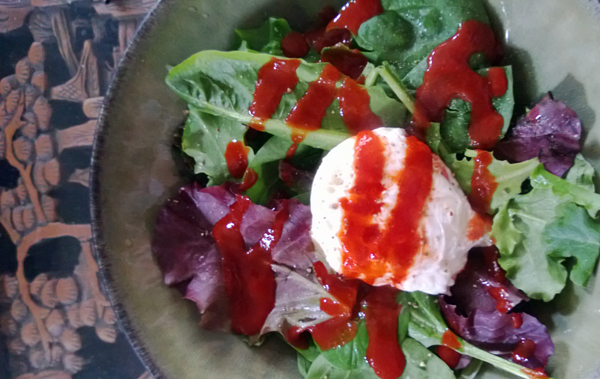 The yolk of the eggs blends with the greens and hot sauce to create a creamy dressing. Categories: breakfast, Quick meals, Under 30 minutes | Tags: Eggs, healthy breakfast | Permalink.